Was born in Glasgow in 1838, and educated at the High School and Glasgow College, where he studied classics and mathematics under Professor Blackburne, and engineering under Professor MacQuorne Rankine. He studied for two years in Germany, at Neuwied, on the Rhine ; and served his apprenticeship with the well-known firm of James Aitken and Co., till in 1862 he joined the Greenock Foundry Company. Shortly afterwards he was appointed superinten­dent engineer for the Cie Valery Freres et Fils at Marseilles, with which firm he was associated for four years. Returning to England in 1866, he became superintendent engineer for the Inman Line at Liverpool, and left this firm to become managing partner in the Greenock Foundry Company with the late Mr. John Scott, C.B. In 1871 he left Greenock, and became senior partner in the firm of Rait and Lindsay, Cranston Hill Foundry, Glasgow, where he remained until 1878. He left the North, and founded the firm of Rait and Gardiner, Engineers, London. purchased Mr. Fife’s masterpiece, the Fiona, built in 1865, and entered her and raced her in many exciting races during each of the subsequent years. Under the well-known scarlet and orange flag, the first race the Fiona won for Mr. Rait was at Cowes, when in August, 1899, she secured the Town Cup sailed under the auspices of the Royal Yacht Squadron. 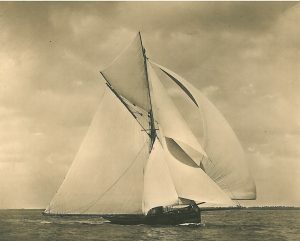 In 1900, against a fleet of thirteen yachts, the Fiona was credited with the first prize in the German Emperor’s race from Dover to Heligoland. Upon the other two occasions when the Fiona entered for this race, she won in 1903 a second prize against twelve starters, and in 1904 a fifth prize against nineteen entries. Other inter­esting races won by Fiona were: Dover to Ostend (1901), Nore to Dover (1901). In this latter race she also won second prizes in 1902 and 1903. For the Channel race, Dover to Boulogne and back, she won first prize in 1902, and again in 1903 and 1906. Clubs: Royal Northern, Royal Thames, Royal Cinque Ports, Royal Temple. Residence: 1, Ulster Terrace, Regent’s Park, London, N.W.